Adults enter into an inevitable tug of war with their tykes as they grow into spirits of adventure and independence. Parents provide guidance and cautions, then without fail, their children test the boundaries, stumble, get banged up, and return to have their parents wipe away tears and soothe their troubled spirits. In today’s reading, Jonah had run away from the directives of the Lord. Like a small child, he ran off and found himself in a terrifying dilemma—in the belly of a great fish. 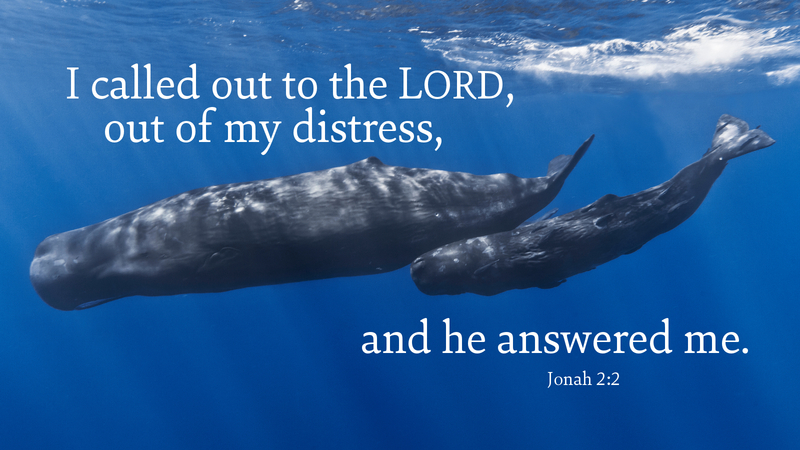 Jonah prayed to the Lord and God responded just as a loving parent would. Our Lord is in the wonderful habit of responding to the countless prayers of his beloved children. We all go through terrifying times in this world and need the reassurances of an ever-present and loving parent. Many of us have experienced prayer responses to varieties of difficult life situations from our loving Father. Like saving Jonah from the belly of a great fish, our Lord has sent his son Jesus Christ to save us from a plethora of impossible dilemmas as well. In the midst of your difficult life challenges, turn to the Lord and find the comfort and healing you need. Prayer: God of love and grace, fill our hearts and minds with the assurances we all need as we struggle through the many seemingly impossible ordeals in our tumultuous lives. Amen. Today’s devotion was written by Rev. Robert V. Alle, NALC Pastor in Hickory, NC.